Wearing nail polish is a popular trend with many female students. Use that interest to learn scientific and research methods while you discover which polish lasts the longest. You can also study the manufacturer’s advertising to evaluate how it is designed to convince you to purchase a product, and whether the product advertising is truthful. The information you uncover could one day be used by manufacturers to improve the quality of the products. Write a hypothesis about what you think the results of your experiment will be. If the data does not support your hypothesis when the experiment has concluded, also write that down. Ask your instructor for permission to conduct your experiment in class. Find 15 female volunteers willing to wear a different color or type of nail polish on each finger for up to six weeks, and if necessary, obtain permission from their parents. Obtain and number five different types of polish, such as regular, neon, glitter, metallic and sparkle, from the same manufacturer. Obtain and number five different brands of polish in a similar color. Conduct two trials comparing the different types from the same manufacturer and comparing five different manufacturers. Volunteers should randomly draw numbers one through five to determine which polish goes on which finger, such as polish #2 on the index finger, polish #4 on the thumb, etc. On the nails of the right hand, paint two coats of polish according to the polish numbers drawn by the volunteer. Repeat the order of polish numbers on the left hand. Record the name of the volunteer, trial number, the type of polish used on each finger and whether the dominant hand is right or left. Tell the participants to note when they find a chip in the polish, what hand and finger it was and the date. You can also check the results each day at school. In between trials, fully remove any remaining nail polish using nail polish remover. Research and record the ingredients in each nail polish. Construct a table with your data, including the price of each polish. 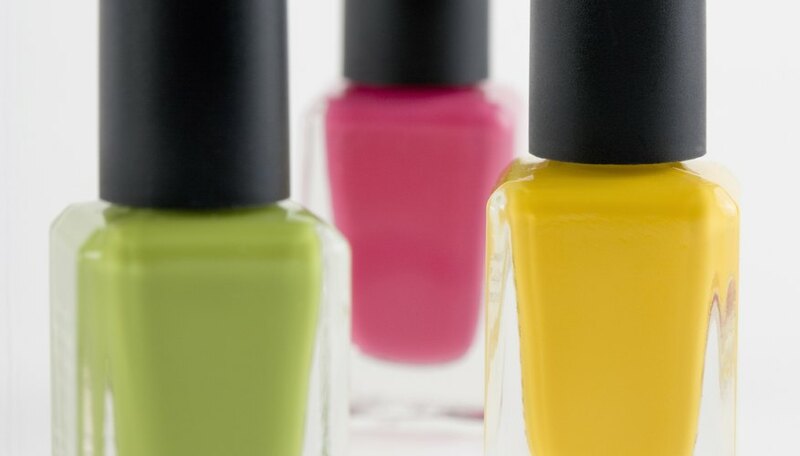 You may find the same ingredient in the polishes that lasted the longest or shortest amount of time. At the end of each trial, draw a bar graph representing the results of that trial. Combine the results of the first and second trials of each group of polishes. Draw conclusions on which polishes last the longest. Did the more expensive brand last longer? Compare your results to the advertising claims of the manufacturer. Did any of the polishes last as long as advertised? Mount Washington Valley Regional Science & Technology Fair: Which Type of Nail Polish is the Best? Strauch, Annette. "A Science Project on Which Nail Polish Lasts Longer." Sciencing, https://sciencing.com/science-project-nail-polish-lasts-longer-10043973.html. 25 April 2017.